The cost is 10 UK pounds cash per class payable to Paul directly at the start of each class. Students who are studying the Wing Chun System receive the Wing Chun Book free in the class. Paul and some of his students ! Paul teaches the two person fighting/combat/self defense techniques as well as the single person empty hand forms and the meditation, healing and spiritual benefits in his classes. Heaven Palm, Earth Palm, Fire Palm, Thunder Palm, Wind Palm, Water Palm Mountain Palm and Cloud Palm. Bear, Monkey, Phoenix, Snake, Unicorn, Hawk, Lion and Dragon. At this level students are learning the moves and how they work. Everything is pre-planned and choreographed. At this level students are learning how to fight. There is a greater element of spontaneous reaction and unpredictability. At the Advanced Level a unique Two-Person Training Drill is taught, it is called Kuen Fa (Fist Fighting Method). Within Kuen fa all previous moves, applications, shapes and concepts can be expressed. 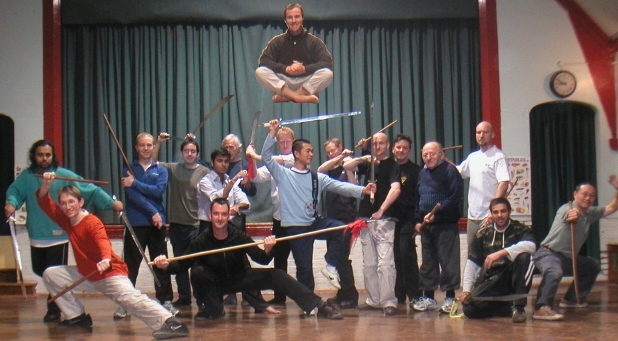 Kuen Fa is the gateway to spontaneous, reflex reaction free fighting.